Longleat is a bit of a strange tourist destination, catering simultaneously to two very different markets. On one hand, it is regarded as the best example of high Elizabethan architecture in Britain, and one of the most beautiful stately homes that are open to public tours. The magnificence of the house itself is matched by the splendour of its surroundings, a spectacular mix of landscaped parkland, lakes and formal gardens. In 1949, Longleat became the first grand home in England to open its doors to the public, and a few years later opened the first safari park outside of Africa. Visitors can drive through eight enclosures, where a wide range of animals can be seen, including elephants, rhinos, giraffes, monkeys, lions and tigers. In recent years, however, Longleat has also become one of the UK's most popular family tourist attractions, offering a wealth of child-friendly sights and amenities. 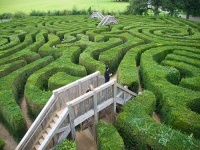 Try not to lose your kids in the world's longest maze, made up of more than 16,000 English Yews. Alternatively, take the little ones for a ride on the miniature railway or to meet some of the friendly animals at Animal Adventure, before letting them run amok in the Adventure Castle. A great option for a fun, excitement-filled day out for the entire family to enjoy.